Don’t you just hate the last day of your holiday? You want to make the most of every last second before you have to go back to work, but that’s difficult when you know you’ve got to go back to work soon. Then you feel guilty for wasting your last day worrying about going back to work. It’s a vicious cycle. 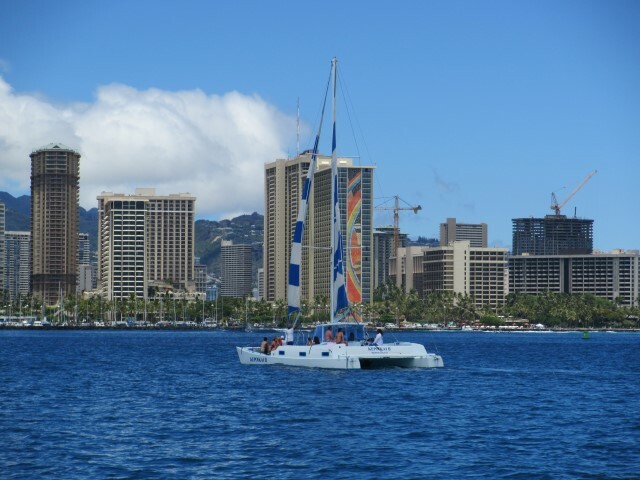 On the last day of our recent holiday in Hawaii we decided to fight the gloom and finish our mini-American vacation in style: by going sailing on a catamaran. 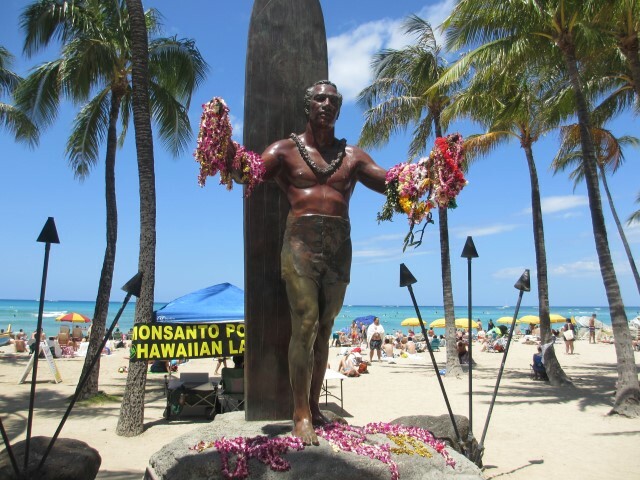 After pancakes for breakfast at IHOP, we checkout out of our hotel and headed down to Kuhio Beach, where we knew we knew you could ride on a catamaran named ‘Mana Kai’ for $25 for one hour ($50 for the both of us). 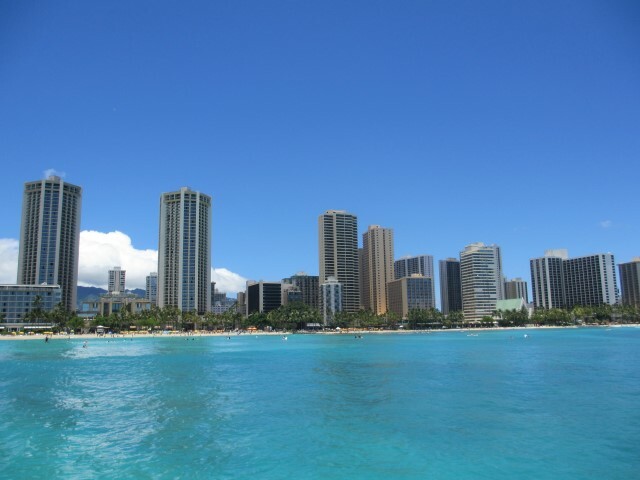 To be fair, it was a wee bit pricey – but we thought it’d be worth it just to see Waikiki from the water. As it turns out, it was. There’s another cat further along on Waikiki Beach that is the same price, but they seem to pack that one to the brim with tourists. Instead, there were only three other couples on our cat – not including the friendly captain and his cheeky co-captain. These two Hawaiians kept us entertained with stories about “local boy” President Barack Obama, before we finally set sail for the open sea. By “open sea” I mean we were only a couple of hundred metres from shore – out past the famous Waikiki surf break, but close enough to soak it all in. It was the perfect vantage point from which to admire Waikiki’s skyscrapers, the beaches, and Diamond Head in the distance. We were showered with a bit of sea spray on the way out – refreshing in the heat – but it was smooth sailing once we got out past the surfers. The weather was sublime, with barely enough breeze to move us along. 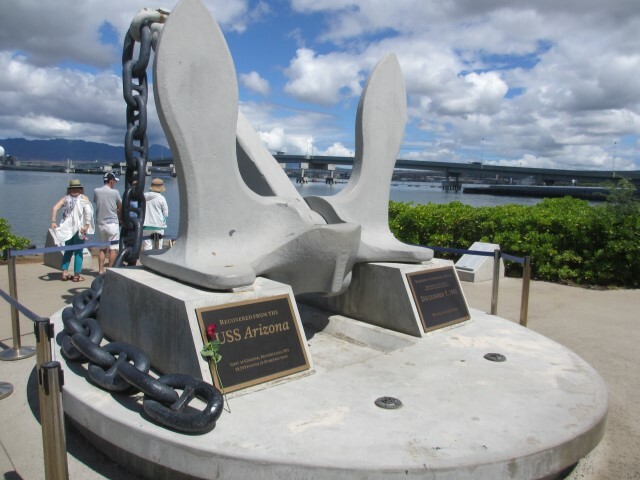 Later, after we’d travelled as far West as Ala Moana Beach Park, we started heading back to Kuhio. Along the way, we got chatting to the cat’s captain. We were pleased to learn that he’d visited New Zealand some years back, and had travelled from the top of the North Island to the bottom of the South. “I hope you enjoy Hawaii even half as much as I enjoyed your country,” he said. 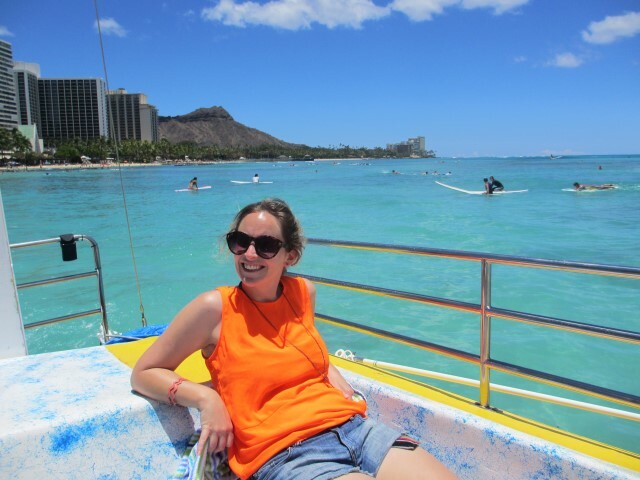 At that moment in time, relaxing on board that catamaran off the coast of Waikiki, I’m sure we did love Hawaii as much as he loved our country. We were bittersweet when we got back to Kuhio Beach just over an hour later. We’d loved our catamaran trip, but, like our Hawaiian holiday in general, we wished it wasn’t over so soon.